Columbus named "Craw-Kan Team of the Week"
Columbus was named the "Craw-Kan Team of the Week" after their 25-14 victory over Chanute. Many people questioned whether former Southeast Kansas League member, Columbus, now in the CNC League, would be able to hang with a traditional SEK football playoff team in Chanute on Friday. Well the Titans came up with the answer and it was yes as they cruised to a 25-14 victory on Friday over the Blue Comets. For their performance they earned this week's "Craw-Kan Team of the Week". The Titans, now ranked second in 4A-II, struck first in the game on a 33-yard touchdown run by senior quarterback, Nate Bole, in the first quarter to make it 6-0. They jumped out to a 12-0 lead at the half after a 59-yard interception return by senior, Kendal Hale. Columbus would score their third touchdown in the game in the third quarter to make it 19-0 on a six yard touchdown run by Bole. Chanute finally responded back and cut the lead to 19-6 with 3:55 to play in the third quarter. The Comets would score another touchdown and a safety, to cut the lead to 19-14 in the fourth, but a 28-yard touchdown run by Zack Roark would seal the deal for the Titans as they won 25-14. Columbus was led by, Bole, who had 69 yards rushing and two touchdowns on the ground. Junior, Jace McDown, led the Titans with 96 yards on 19 carries. The Titans, who are gaining some statewide hype, will be in action this Friday against league rival, Southeast-Cherokee. The Titans, led by head coach Dan Grundy, are the first ever "Craw-Kan Team of the Week". This new partnership with Sports in Kansas will highlight a Southeast Kansas Area team weekly and their achievements. For complete info: see below. 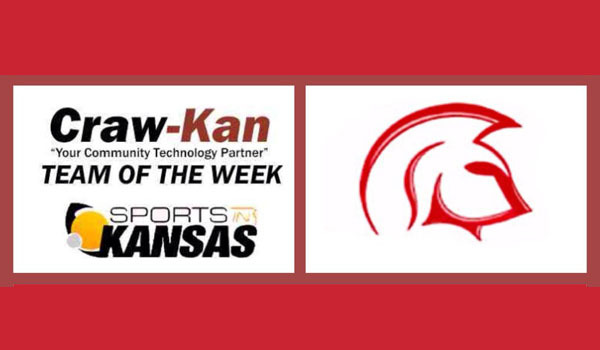 Craw-Kan "Your Community Technology Partner" and Sports in Kansas will be in partnership over the 2014-2015 school year to release a "Craw-Kan Team of the Week". "I am very excited for this partnership with Craw-Kan and highlighting teams from the SEK area," said Sports in Kansas Managing Partner, Chet Kuplen. "Not only does this help athletes and teams to be promoted for their achievements, it also lets the area know what all the new products that Craw-Kan has to offer". "Craw-Kan offers all your technology needs in the area from internet to web design and cell phones to security systems." said Craw-Kan Marketing Manager, Zach Adams. "We have a lot of new products and are excited to have them to offer to the area." Nominations will be accepted from every Friday-Monday, with the "Craw-Kan Team of the Week" being released every Tuesday on Sports in Kansas (Kansas-Sports.com). Teams must be nominated via email or twitter.